Download the GivePlus app, enter zip code 46227, and select Calvary Lutheran Church & School. Christian stewardship begins with the understanding that all we have is God’s and we should use it for His purposes. We give our lives to God — our Time, Talent and Treasure. Click here to see opportunities for using your time and talents to serve God and neighbors. And check out this page for information on sharing your treasure at Calvary. We encourage all of those who are part of our Church family to give—not out of obligation but out of a spirit of worship. Your gifts allow God's work to be done in our midst, in our community, and in the world around us. Giving options include regular weekly giving, one-time gifts, giving to missions, endowments, etc. There are electronic options and, of course, offerings during our weekend worship services. There are several easy ways for you to give electronically. Your information is transacted securely by an SSL encrypted connection. This information will remain private and will never be given away to third parties, other than to process your scheduled contributions. In response to God’s generosity to you, we invite you to take the time to do as God suggests and give generously to the work we do together as a family at Calvary and the many missions and agencies that we support. Calvary's Stewardship Ministry Team publishes a Quarterly Stewardship Newsletter with information on stewardship principles, giving opportunities, and supported ministries. Click here to see the latest edition. To help you do consider your giving "as you have decided in your heart,” we encourage you to explore the following questions. 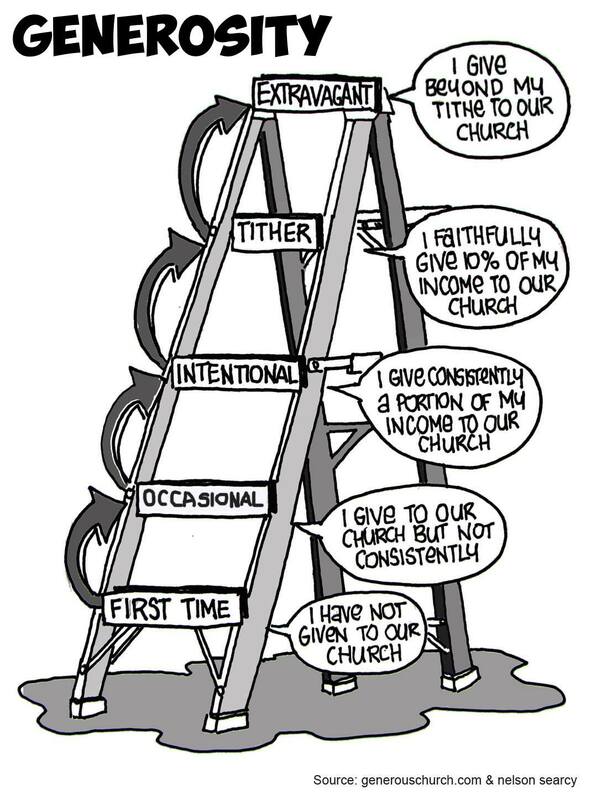 Where are you now on the generosity ladder? If you are already experiencing the blessings of tithing, or if you are already giving to God beyond the tithe, is God calling you to take a step of faith and to increase the percentage you are already giving to the ministry of Calvary? If you have only given occasionally here at Calvary, is God calling you to take a step of faith and become a consistent giver? This could be quarterly, monthly, biweekly, or weekly. It could be a set amount that you decide in advance or a percentage of what God has provided for you at the time. If you have not yet given financially to the ministry here at Calvary, is God calling you to take that step of faith? Calvary is making a difference in our community and in the lives of those who call Calvary their church home. Please help to make even a greater impact in 2019! If you are interested in volunteering with a Calvary ministry team or with a specific project, check out our Serving @Calvary page. Wanting to join a small group study? Check out our Bible Studies and Our Communities pages, or look at the brochure rack outside the office to find a group that meets on a date/time/location that is right for you. Keep up with the activities at Calvary by subscribing to the Monday update and our Daily Devotions email. Sermon recordings and bulletins are posted weekly on our This Week @Calvary page if you are not able to join in worship. At Calvary Lutheran Church & School, giving is joyous response to God for the love and forgiveness we have freely received in Jesus. We should never give out of obligation or guilt. Our gifts are an act of worship and thanksgiving, as we offer to God what He has first given to us: the first and best. Our gifts enable us to fulfill our mission of Engaging People In Christ. During all of our worship services, there's an opportunity to give as Offering plates are passed. Give simply and securely via your debit card, credit card, or bank account. You can customize your donations to be one-time or recurring gifts. If you create an account, you can also view your giving history. Text any dollar amount, between $10 and $2,000, you would like to give to xxxxx. You'll receive a text with a link to complete your payment details. Tap the link. Enter your info with the credit/debit card you'd like to use. You only need to fill out this form the first time you give. Next time you would like give, just text your gift amount to xxxxx! You can donate stocks, bonds, or mutual funds as gifts or do a planned gift as a portion of your estate. If you are interested giving a gift in this way, please contact the church office. Calvary has several endowment funds that support our work for the Kingdom of God. Your gift to Calvary’s Endowment Fund enables you to continue giving to Calvary forever, providing the church with a dependable source of earnings in future years. You may contribute to the endowment fund through a gift of cash or stock, naming the endowment in your will or as a beneficiary on your life insurance policy, pension plan (401k) or IRA. Contributions may be made at any time through listing “Calvary Church Endowment Fund” on your Offering envelope. Each year the distribution from the Endowment Fund is added to the Annual Fund to provide scholarships to a Calvary family that would not otherwise be able to afford a Christian education in our School. We thank God for the generous gifts that provide more families with the opportunity to experience the blessings of a Christian education. Scholarship recipients are supported each school year. To give using your Offering envelope, mark “Schwark Annual Fund” or “Schwark Endowment Fund” on your envelope. The primary purpose of Wessler Scholarship Endowment Fund for Education of LCMS Church Workers is to provide financial aid to Calvary students, former students, and their families in LCMS colleges, universities, pursuing a full-time church work career within the ministry of the LCMS. The fund was established in 2018 through the generosity of Mel Wessler and the Distribution Committee is pleased to announce that Calvary’s Youth and Family Director Sam Troemel is the first recipient. Sam is enrolled in the LCMS Specific Ministry Pastor which enables students to take seminary courses from a distance as they prepare for ordination. Making a memorial donation in your will is a way to show your support for Calvary’s mission and ministry. Memorial gifts can support the general fund or can be designated for a specific purpose. Please contact Calvary’s Business Manager for language that can be added to your estate planning documents. If you would like to mail a gift, you can send it to our main address: Calvary Lutheran Church and School • 6111 Shelby Street • Indianapolis, IN 46227. Note: All undesignated gifts will be placed into the general fund. Why does a Christian give? People do not bring anything with them when they come into the world; when they leave the world, they will take nothing out. God rules and directs all things in heaven and earth by His almighty power (Psalm 147). Everything is to praise God. We have a purpose. All things in heaven and on earth — including us as His people and even those without life in themselves — glorify God, for all show His wisdom, His power and His love. What is General Fund vs designated giving? The General Fund is a pool of resources that the leadership of Calvary uses to fund the ministry – from pastor and teacher salaries to utility bills to mission support. Details of Calvary’s General Fund budget are provided to the members during the annual meeting in May and published in the annual report. Designated gifts support specific efforts such as funding for a youth trip, disaster relief, or a special appeal. When you designate a gift, it will be used for that purpose. An endowment is a fund where the initial donated amount (principal) is maintained and a small percentage, amount earned from interest, is used for a designated purpose. Calvary benefits from the generosity of several endowments. For details on establishing an endowment that benefits Calvary please contact the Business Manager. Can I include Calvary in my will? More and more companies are offering corporate matching programs. These programs will double, and sometimes triple or quadruple, an employee’s donation to a select nonprofit. Other times, companies will offer grants to a nonprofit if their employees volunteer their time at that organization. Your employer’s human resources department will have information on if there are programs available to match your contributions. Also be mindful of ways to designate Calvary as a beneficiary of your purchases. Companies such as Thrivent, Amazon, and Krogers will direct a portion of your purchases to the charitable organization of your choice. Late last year, Lutheran Child and Family Service raised funds to purchase 12 stained glass windows for the Chapel at Lutherwood to assist with the spiritual growth of the resident children and staff. Lutheran Child and Family Services has helped families and children in our community for over 100 years. Through the years numerous Calvary members have served this ministry including Pastors Knuteson, Hellert and Kolb along with Bill Laut as CFO. Currently Deaconness Emily Spelde and Pastor Emeritus Wehrmeister serve on the LCFS Spiritual Advisory committee. Founded as an orphanage, LCFS has evolved throughout the years to meet the needs of the community. Today, their services include Lutherwood, a licensed Psychiatric Treatment Facility that specializes in the care and treatment of Children who exhibit behavioral or emotional impairments; the IMPACT Program, a residential treatment program for girls who have been victims of human trafficking; and Trinity House Independent Living Group Home, for young men aged 16-21 who are transitioning from the Foster system to the real world. In addition to these program, Lutherwood hosts to the Emergency Shelter Care, a dedicated dormitory for young adults whom the Department of Child Services has removed from their home. Calvary’s thankoffering gift supported the May Window. As a boy Henry May was an LCFS resident. He is the father of our Indiana District’s retired President Pastor Daniel May. A dedication of the installed windows took place in April. Our Annual Report is an chance to keep our eye on the numbers that matter. Behind every metric is a story, so here is this year's narrative: fulfilling our vision to Grow Leaders for the Mission of God. Calvary members give of their time, talents and treasures in many different ways. Our Annual Report is a good place to find information on the generosity of our members. Our 2018-2019 congregational theme is “Growing Leaders for the Mission of God”. This involves inviting and equipping others to serve, raising up youth and young adults to be the church now, and investing in the growth of ourselves and others (Vocation).